My husband and I live between many different worlds and belong fully and completely to very few. When I first used the title, "An American Between Worlds," it was from an essay I wrote for the first Bilingual/Bicultural Family Network newsletter. But over time, I have come to realize that living between worlds is more than just language and culture for me. Living between worlds is the result of the accumulated choices my husband and I have made to live a fuller life. Perhaps it has to do with wanting to have our cake and eat it too? Why must we limit ourselves to one choice, one group, one reality? I'm not asking that the society in which I live change its most basic structures and nuances. I am simply wanting to live in it in a way that matches my image of who I am on all levels. The choices of language and culture in my life are simply the result of having fallen in love with someone from another culture and wanting to understand him completely. How can I understand who my husband is if I can not speak his language, have never lived in his country, have never spent time with his parents, siblings and cousins? I need to walk on the soil of his family's small, now-retired dairy farm; I need to smell the halls of his university and meet his friends; I need to taste his favorite foods and to squint when the winter sun hovers just over the edge of the horizon at noon and to then run home and snuggle on the rug in front of the heater in our tiny two-room apartment which had no shower or hot water and our toilet half way down the building's staircase. I needed to live with my husband in his world to understand him, to be able to be a part of his life. But to do so has meant to compromise my comfort and security, to step over an invisible threshold and to stand between two worlds, never committing to either fully yet cherishing both completely. The same is true for other aspects of my life. My husband and I are homeschooling our children which has meant we have become friends with a whole new group of families (and unfortunately has made others choose to not have anything to do with us). But even in this choice we do not belong 100%. We are homeschooling while also both working part time. This means, we have to be extremely creative with how we go about this, a level of creativity that many other homeschooling families do not have to deal with (and which coworkers can simply not quite understand how we cope). We are unable to participate fully with the plethora of activities, events, gatherings and more that our local homeschool group organizes each month. Thus, we live a little on the edge of this world, not fully able to participate yet commited fully. And what about working part time? I work in an office where most employees work full time and more. Our country has not yet come to appreciate the benefits of letting skilled workers who want to work part time do so. Working part time offers my husband and me a balance in life between participating with other adults out there in the world while at the same time giving us the space to be parents of three children and to foster our private nest at home. Living between these two worlds is often the most difficult, in part because there are so many unspoken judgements that are placed on us from society as a whole. In addition, we live at the whim of others who can influence our standard of living so completely. If we were to lose our jobs, our incomes would disappear and from there many changes would take place. Not that these changes would be bad, they would simply be placed upon us without our wanting them to take place. So, we are forced to work hard on this balance - not letting our jobs take over too much of our lives and not letting ourselves forget how important our jobs are for our family's livelihood. 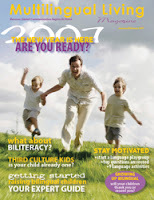 Then there is Multilingual Living Magazine. Ah yes, this magazine is in a world of its own. It itself straddles worlds, cultures, languages, families. Each issue makes me realize how little Alice and I actually shape it and form it. We simply start the ball rolling, lay out the foundation, set up the canvas and then stand back and watch as others complete their creations. We then we put these creations on display for others to enjoy as much as we do. This is my life between worlds; an American between worlds. Somehow, when I am not looking, these worlds fit themselves together and create something colorful, rich, fascinating, boring, frustrating, stressful, joyful, amazing and exactly what my husband and I have always been looking for. What a great post! I really enjoyed reading it. I often feel like I am in between worlds as well living with my French husband and adapting our life to each others culture. We are not simply American or French. We are Franco-American. We are constantly being pulled and pushed between the two cultures and languages. Thank you for sharing your own experiences. It helps to read about another persons life between worlds. I enjoy your blog for exactly the same reasons. Finding out that I am not alone in this experience has been a total realization for me! Yeah Corey! I am so glad that you moved to blogger. Just stopping by to say hi and welcome! Hi Trisha, thanks for welcoming me. I'm having a great time here so far. Much easier than updating the BBFN site with dreamweaver! Yeah, we live between worlds, too. Which is why you don't have to say much and I just understand what you mean. We create our own world, our own space - someone recently said "bubble" which seems to carry the connotation of exclusion, but I know what she meant with that, too. Fascinating this peek into your homeschooling life! I'd love to read more about this if you'd care to share more. As I said before, I totally admire the way you are able to handle so many things, and so well: mothering, working, homeschooling AND the magazine!!!! Alice - yes, you are so right! Just mentioning a sentence is enough for people to understand it. I was reading a blog entry by Dinka recently and she was talking about her move to the US and contemplations about groups and group mentality. Oh my gosh, I need to add a comment to her entry because it was JUST what we feel here. We so much want to be part of something but when we are part of it, we realize how we just don't completely fit in. Arghh. On the one hand, I like this. It is who I am as an individual and who we are as a family but on the other hand, I feel like a stranger in the world, an outsider. Yes, like being in a bubble and unable to completely pass through that thin membrane. Ah, homeschooling. YES! I will definitely write a blog entry about this as it is on my mind a lot. Right now R is doing most of the work in German and the kids LOVE it! They always ask, "Can Papa do homeschooling with us?" When I say, "I have some time, should I do it with you?" They both say, "No, Papa!" I'll share some of his tricks... being that he is a teacher, he just has that special way of explaining things so that others want to learn. My approach is the hyperactive, excited mom: "Hey kids, yippee, look at this, yippee, homeschooling, wow, come on over to the table, we're going to have some fun, fun, fun." They kind of just look at me and then I say calmly, "Ok, I get it, so, who wants to do some homeschooling?" :-) The good thing, they are ALWAYS asking to do homeschooling. They see it as fun and they feel a sense of accomplishment. I mean, something must be working when your 3 and 5 year old beg to do just "one more page of Math, PLEASE!" R and I don't take any credit for this, really, other than just staying relaxed, keeping it fun, encouraging them but not pushing them, only letting them do "homeschooling" with us (so that we can keep a focus on the work), and keeping some general consistency in how we approach it (so that the kids know what to expect). Hi Corey! Congrats on your new blog. 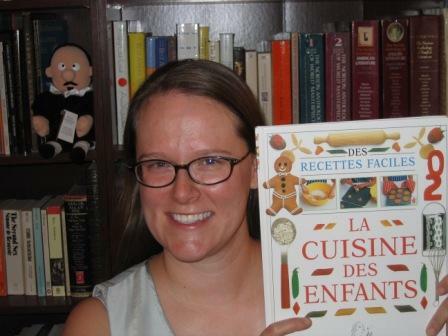 I look forward to reading more about your linguistic adventures with your family! My friend Amy is homeschooling her young'uns and teaching them French along with English, so I'll pass your blog along to her as well. While I'm sure that it's hard sometimes for families like yours and Alice's to reconcile the different languages and cultures and backgrounds that you bring into the mix, it certainly makes your and your children's lives richer. While I teach French, I've spent less than two years living in France, so it never felt quite like a home to me. And now that I'm married to a fellow American who has zero interest in living outside the US--or even in learning a foreign language--I feel a little regret that our future children probably won't get to experience other cultures other than with short visits to other countries. I will probably be able to teach them French, but not France. Sarah - despite the limited association with French culture, it is fabulous that you are making the effort to teach your nephew French! And I'm sure you will find a way to teach your future children French as well (and maybe your husband too *grin*). You clearly are motivated and have "done your research" so I can't imagine you will give up without trying as hard as you can. Yes, please let your friend know about our homeschooling venture since it sounds like we have a lot in common. Many days I simply don't know what we are doing but in the end it seems to be working. I keep feeling like we need MORE plans, MORE consistency but then I realize that our kids are still young and we kind of go with the flow in terms of their interest. I'm still not sure how to approach learning with C but I have gotten a few books about learning styles and it was great fun to read Sarah from Alphabet Garten's blog about the different teaching styles she uses with her sons. I am definitely keeping up with your blog - if anything, to keep me motivated with ideas! :-) And since we are starting with French as our "foreign" language, I'm sure you will give me a lot of ideas there too. Thanks for your support, Corey! And as far as my hubby's lack of interest in French, well, he's an engineer, and you don't see me trying to learn much about his field either! Hah, touché! Is he a structural engineer? Perhaps a visit to France to discuss the structure of central-Europe building constructs? ;-) If he is a software engineer, well, sigh, then there isn't much hope. Hee hee, just kidding. You see, I'm a software QA engineer for AOL and am always amazed with how focused on task the software engineers are in my office. So nice to "meet" you via your comment on my blog. I'm glad to have found yours and hope it will be alright for me to link it to mine along with BBFN. My husband and I don't quite have a bilingual bicultural "family" yet (no kids) but I did want to put BBFN on my blog because I know some of my readers have children. It's such an awesome site! I'm looking forward to reading your blog regularly. Beloved: Greetings! Thank you for stopping by and thank you for your praise of BBFN. It certainly is an effort from the heart so it is so nice to get feedback. Yes, I'd be delighted if you linked to my blog and I am adding you as well. Much of raising bilingual children is about what it is like living between cultures (Alice wrote a great piece in our current issue of Multilingual Living Magazine about Third Culture Kids - what it is like to be one) and your blog is so much fun to read just for that reason. It is so much fun to learn about other cultures via those living there or having lived there. I will definitely keep an eye on your blog! An American married to a German, mom to three bilingual children, homeschooling in two languages, working part time for a technology company, and producing a digital magazine for multilingual families. My new website is up and alive: Multilingual Living! Please come join me there! Did you know I give a three-hour seminar on Raising Bilingual Children at Bellevue Community College? Sign up for the Multilingual Living email list and you'll be notified when the class schedule is up. My brother on guitar, my husband on the Bodhran drum and me singing my song "Going Down"
How Short Should I Go? A Great Place for Expat Women!